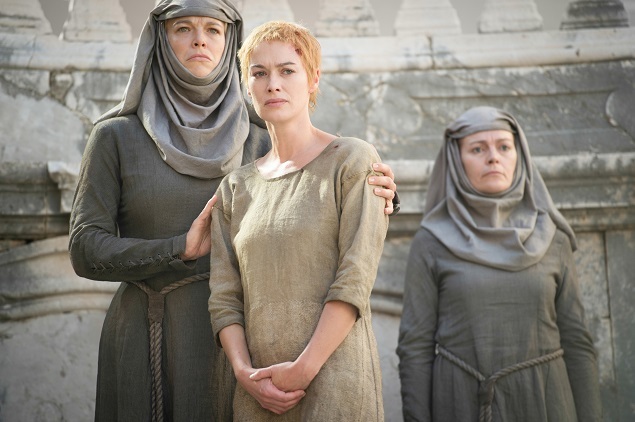 Lena Headey stars in Game of Thrones’ Season 5, episode 10. Photo: Helen Sloan/courtesy of HBO. If you thought Season 5 was crawling along, the events of “Mother’s Mercy” more than made up for it. Like any true Game of Thrones finale, this one was jam-packed with as many cliffhangers, plot twists, massive betrayals and character deaths as writers could possibly fit into one hour. While it included the unpredictability that makes this show both unique and entertaining, there was also so much intrigue that at times it felt as if it was being shoved down our throats like pigeon pie. For one, the downtrodden Stannis Baratheon (Stephen Dillane) sacrificed his daughter, Shireen (Kerry Ingram), to no avail. He had hoped her burning body would light the way toward Winterfell and its downfall, but things don’t ever turn out the way they’re supposed to. The Lord of Light did indeed reward him by melting all the impassable snow, as Melisandre (Carice van Houten) saw in her fires, but he also consequently awoke to news of his wife Selyse’s (Tara Fitzgerald) suicide (death #1), half of his army deserting him, and Melisandre’s hasty and mysterious departure on horseback. Of course, Stannis didn’t even react to the pile of bad news. He and what was left of his troops continued their march on Winterfell with the intention of storming the castle and taking the north. But their siege instead turned into a slaughter when they were greatly outnumbered by the Bolton army, which emerged in a surprise attack. 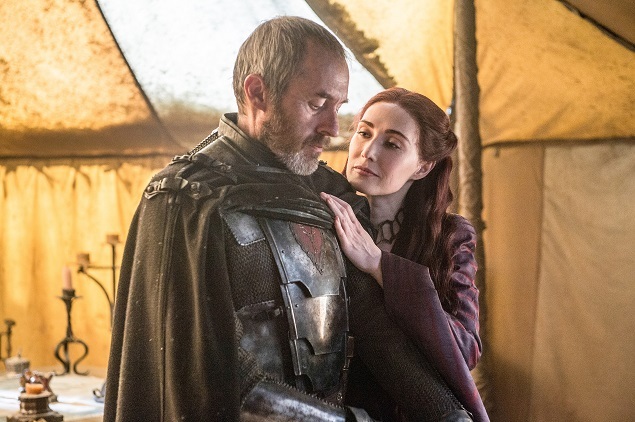 Stephen Dillane and Carice van Houten star in Game of Thrones’ Season 5, episode 10. Photo: Helen Sloan/courtesy of HBO. Stannis’ plotline may have been building up to the moment when he finally captured Winterfell, and yet this potentially epic battle was completely overlooked. We catch only a glimpse of the action at the end, when Stannis staggers to his feet and cuts down two more Bolton soldiers, but not before taking a nasty wound to the leg. As he slumps against a tree, coincidentally Brienne of Tarth (Gwendoline Christie) shows up, thirsty for vengeance. After finally getting confirmation that Stannis killed his brother, Renly, with blood magic, followed shortly by his anticlimactic surrender, a brief swing of Brienne’s sword made Stannis’ death #2 — a possible foreshadowing for what happens in the books. Meanwhile, Sansa Stark (Sophie Turner) took this warring distraction as an opportunity to finally light the candle in the broken tower at Winterfell. Apparently, she stayed up there for the entire battle, because when sneaking back to her room, the Bolton troops were already arriving (way to wait until the very last minute…). But before psychopath Ramsay Bolton (Iwan Rheon) could find her, a bow-wielding Myranda (Charlotte Hope) did, along with Reek (Alfie Allen). As Ramsay’s beloved tormented Sansa with talk of stripping her of her skin except for her biological parts, out of nowhere Reek snaps, pushing Myranda off the balcony (death #3) and saving Sansa — somewhat redeeming his betrayal of the Starks. The two of them exchange a look, knowing full well what will happen to them when Ramsay finds out. Hand in hand, they step up to the edge of the rooftop, and jump — a hopeful leap into next season, though we don’t know if they survived the fall or not. 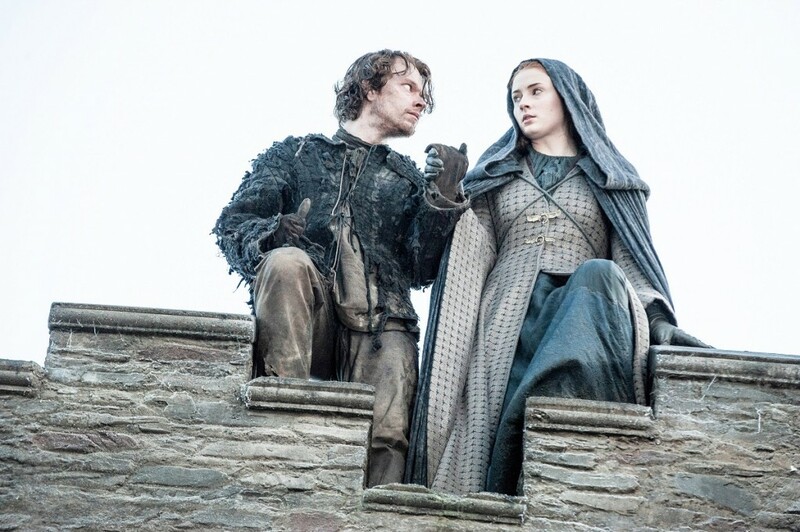 Alfie Allen and Sophie Turner star in Game of Thrones’ Season 5, episode 10. Photo: Helen Sloan/courtesy of HBO. Her sister, Arya Stark (Maisie Williams), on the other hand, is under some very different circumstances in Braavos. She stole a face from the Many-Faced God and posed as a child prostitute, acting as a beating post for Ser Meryn Trant’s (Ian Beattie) sadistic guilty pleasures. But almost immediately, Arya joyfully got her revenge. She lunged for Ser Meryn, stabbing him in the eye, and then the other eye, all while gagging him. Then after revealing her true identity, she slit his throat like someone once slit her mother’s. It’s the bloody, vicious triumph Arya fans — and Arya herself — have been waiting for. But her elation is hard to hide, especially to Jaqen H’ghar (Tom Wlaschiha). “Only death can pay for life,” he says when confronting her in the Hall of Faces as she put her borrowed face back. 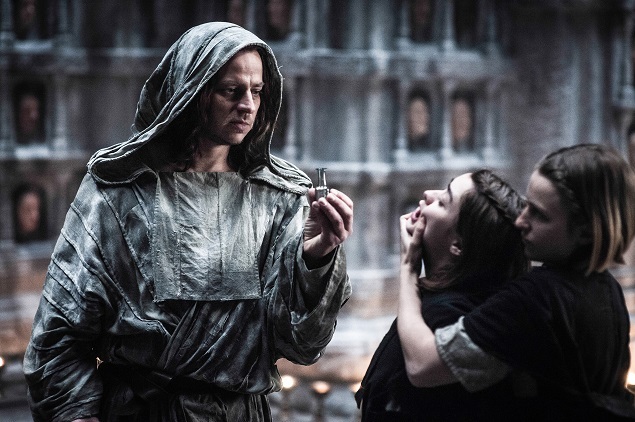 At first, it seems like he is going to force poison down her throat as punishment, but Jaqen empties the vial down his own throat instead and falls dead to the ground (death #4?). Arya weeps for her friend, but Jaqen suddenly appears behind her. When she confusedly reaches out to touch the corpse, its face pulls away to reveal another face, and then another, then another, until the last face is hers, and she begins to truly grasp what it means to be “no one.” It’s the last thing Arya sees before she goes blind, screaming in panic. Tom Wlaschiha, Maisie Williams and Faye Marsayin star in GoT‘s Season 5, episode 10. Photo: Helen Sloan/courtesy of HBO. It seemed this entire season Arya’s time at the House of Black and White was dragging on, and now the finale is when her plotline decides to take a curious turn. We are just as impatient to find out what happens as Arya is to become a Faceless Man. The same, however, cannot be said of Daenerys Targaryen’s (Emilia Clarke) situation in Meereen, where all sorts of problems, from the Sons of the Harpy to Tyrion Lannister’s (Peter Dinklage) arrival, have kept things fresh. After flying away on Drogon to a beautiful but barren wasteland — following the chaos that ensued at the fighting pits — she is left hungry with a lazy, wounded dragon. Determined to get back to Meereen, it couldn’t be a worse time for a hoard of Dothraki bloodriders — a familiar yet terrifying group of people — to find the dragon queen (former Khaleesi) all alone. The swirling mass of riders encircles her, thousands strong, until she seems to disappear. It’s doubtful that Ser Jorah (Iain Glen) and Daario Naharis (Michiel Huisman) will track her down during their rescue mission headed north. But her inimitable ring that she cleverly dropped in the grass during the khalasar’s descent may just be the gleaming breadcrumb she needs to find salvation. 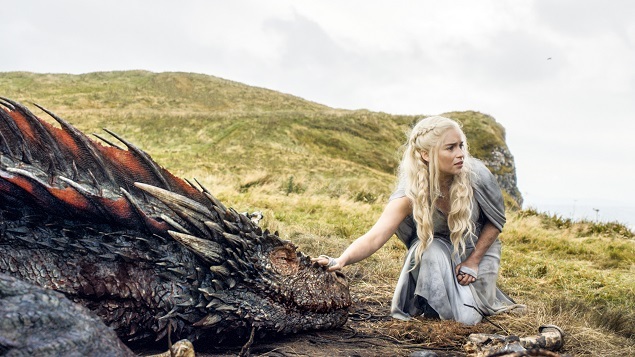 Emilia Clarke stars in Game of Thrones’ Season 5, episode 10. Photo: Helen Sloan/courtesy of HBO. Meanwhile, Tyrion stays behind to manage the city — albeit behind-the-scenes — where Grey Worm (Jacob Anderson) will serve as the more visible figurehead with Missandei (Nathalie Emmanuel) as his trusty confidant. Varys (Conleth Hill) also appears once again by Tyrion’s side (cue the witty banter), armed with his network of spies. There is no stopping this political dream team, and we can only hope that the quartet lives up to all of our expectations. This heartbreaking scene was all the more poignant when Olly (the equivalent of Brutus), who Jon took under his wing, dealt the final blow. 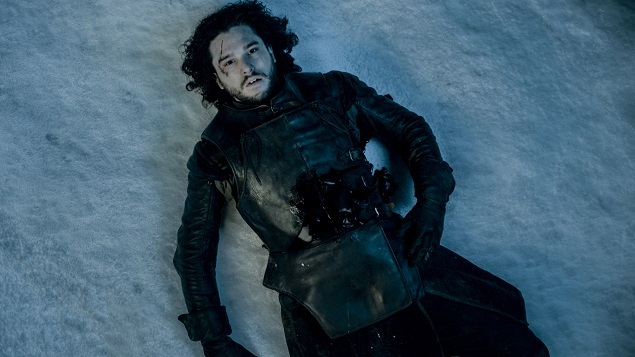 Jon — a seemingly untouchable character — was left cold and sitting in a pool of blood-stained snow (death #5). Kit Harington stars in Game of Thrones’ Season 5, episode 10. Photo: Helen Sloan/courtesy of HBO. Not even his best friend Samwell Tarly (John Bradley) was there to save him, for he left The Wall with Gilly (Hannah Murray) to head for the Citadel, where he will learn to become a Maester to ultimately replace Aemon. Unfortunately, Sam, Jon won’t be coming back this time. Or will he? The fact that Melisandre abandoned Stannis before the failed attack on Winterfell in order to return to The Wall hints at some enigmatic events in the future. She has always had her eye on Jon for some reason, and after all, the Lord of Light has produced some incredible miracles before, including resurrection from the dead. So while Harington might like us to believe his journey is over, according to a recent Entertainment Weekly interview, we’ll keep on hoping that he’ll be back in some form. Not only was Jon’s death a highly anticipated bombshell, but so was Cersei Lannister’s (Lena Headey) walk of atonement in King’s Landing. After who knows how long in the solitary confinement of the Seven, the proud Cersei confessed her sins (well, some of them) to the High Sparrow (Jonathan Pryce). And though she is shown the Mother’s mercy and allowed to return to the Red Keep, how she had to get there is a punishment fit for a queen. Shorn and naked, Cersei is forced to walk through the filthy streets and mob of city folk back to her home. She makes the humiliating march all the way back to the gates of the Red Keep, showing up covered in spit, food and excrement, and with bloodied feet — yet the whole time, she maintained her regal composure like the strong Lannister she is (an admirable quality, we hate to admit). While it’s satisfying to see the devious queen finally getting what she deserves, it’s impossible not to feel for her in this moment of shame (pun intended). 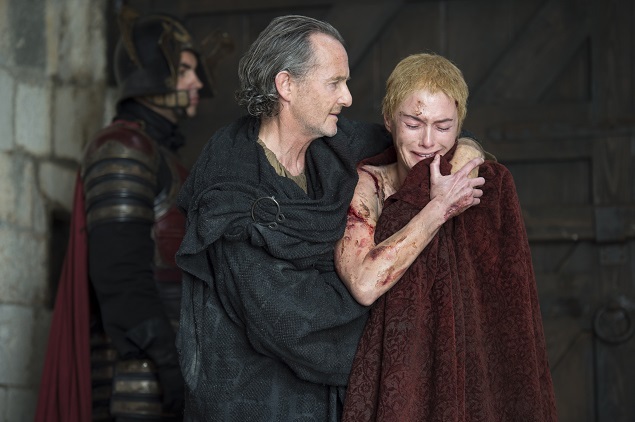 Headey’s brave performance and then ultimate emotional collapse into Qyburn’s (Anton Lesser) arms (her only ally) are enough to disarm any Cersei hater — if not for a little while. Anton Lesser and Lena Headey star in Game of Thrones’ Season 5, episode 10. Photo: Helen Sloan/courtesy of HBO. How she will repay her enemies for this, we can only guess — burning the city to the ground is often her go-to option. It won’t be hard to do with Qyburn’s “welcome home” gift — a new member of the Kingsguard, or “The Mountain” reborn, who at one point had sworn to execute her enemies. While her walk of shame was well executed, delving into the details of her ignominy, it’s disappointing that only half as much effort was put into the battle at Winterfell, which lasted all of two seconds. Oh, and what’s another death to round out the episode? In Dorne, Jaime Lannister (Nikolaj Coster-Waldau) and Myrcella (Nell Tiger Free) set sail for King’s Landing, after bidding farewell to Doran (Alexander Siddig) and company. Ellaria Sand (Indira Varma) gives the princess what seems like an uncomfortably long kiss — but hey, the Dornish people might just be affectionate. Then, in one of the rare warm moments of the show, Jaime and the princess have a touching heart-to-heart, father to daughter, when Myrcella admits she’s known about his and Cersei’s incestuous relationship all along. “And I’m glad. I’m glad that you’re my father,” she says. 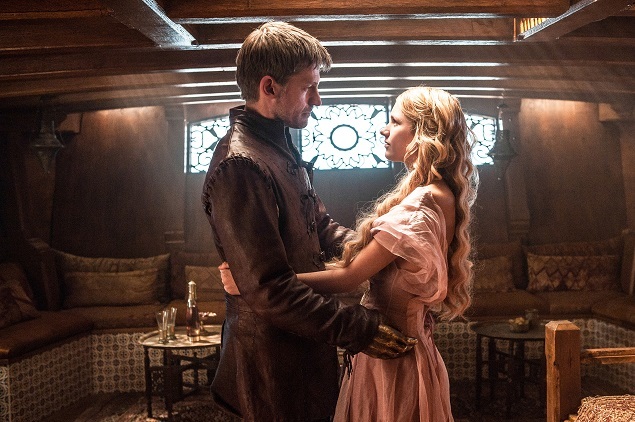 Nikolaj Coster-Waldau and Nell Tiger Free star in GoT’s Season 5, episode 10. Photo: Helen Sloan/courtesy of HBO. Of course, the teary-eyed lovefest is ruined when Myrcella’s nose starts to bleed, and she collapses to the ground (death #6). Back on the docks, Ellaria wipes first her nose and then what looks like poisoned lipstick from her lips, and takes a swig of antidote from a small vial, her vengeance at last sated. War between the houses of Martell and Lannister now seems imminent, and poor Prince Trystane (Toby Sebastian) is quite literally walking into the lion’s den. About every single character in this episode experienced a major blow or plot twist in some way or another, heightening our anticipation for what comes next. This season overall has delved into unchartered territory, moving past the glacially slow print novels so that for the first time, no one in the audience knows what’s going to happen next, and that’s exciting. Between the fallout of major characters, the impending slaughter by the White Walkers, and Daenerys’ uncertain future, one can only hope that Season 6 arrives sooner rather than later. Sam’s not a virgin! Jon could not be more proud. Video courtesy of Game of Thrones. Copyright GALO Magazine LLC 2019. All Rights Reserved. The material on this site may not be reproduced, distributed, transmitted, cached or otherwise used, except with the prior written permission of GALO Magazine LLC.